Iran, together with Turkmenistan, possesses almost 28% of the world’s total proven natural gas reserves. When the imminent lifting of Western sanctions takes place, Iran, holder of the world’s largest natural gas proven reserves, will do everything to re-establish its export of hydrocarbons (oil&gas) to Europe, in order to spur the nation's sanctions-battered economy’s recovery, although this contrasts with Iran’s recent statement that they will not sell gas to Europe, to soothe the Russians, who are now needed for their political and economic plans. Nevertheless, it is very possible that the EU will not need, or simply, will not be able to purchase both Iranian and Turkmen natural gas together, beyond 2020. The Union adopts a neutral stance between the two countries and their race to supply Europe with gas. The Commission will consider all economically and politically viable projects in the near future, to strengthen its energy security and secure diversification of natural gas supply routes. In this situation, also bearing in mind that even if Iran or Turkmenistan do eventually sell gas to Europe, in the short to medium term, the only possible way for it is only through the TANAP. Iran can, therefore, become a major competitor to neighbouring Turkmenistan, holder of the world’s 4th largest proven reserves. Iran joining the European gas race - cardinal change of geopolitical patterns in the Caspian Basin? Iran’s joining the geopolitical energy picture will definitely change the balance of powers in the Caspian Basin, and alter the energy landscape in the region. The Islamic Republic may become not only the strongest player, but also the game-maker. The willingness of Iran to participate in the Southern Gas Corridor pipeline project (SGC), with continuing efforts to reach the European energy market is clear. Natural gas, via the TANAP, to the amount of 10 bcm/year, will reach Europe by 2020, but it has already been fully contracted by the consumers. In January 2020, the TAP should also come on stream with 10 bcm/year of Azeri natural gas. However, the next phase of expansion of the SGC will only take place in 2026, and until then, only an extra capacity of ca. 10 bcm/year for additional natural gas volumes will be available, due to the limited transmission capacity of both pipelines. Increasing the exports of natural gas is among the main goals of the Islamic Republic’s 6th Economic Development Plan, which is due to start in 2016. Iran hopes to trigger the inflow of new, foreign direct investments in the country’s energy sector, which would help it increase its natural gas exports to Europe by up to 20-25 bcm/year. Iran truly has great potential, but it probably will not be able to play an important role in the international gas markets, earlier than 2020, as it does not possess the necessary technology and infrastructure to implement all the major projects on gas production. Iranian gas is mainly concentrated in the south around the Persian Gulf, and there is not sufficient infrastructure to transport it to the north, so ironically, Iran has to resort to buying gas from Turkmenistan to supply its Northern provinces. The lack of infrastructure is a major obstacle for Iran, as domestic natural gas consumption is growing tremendously. In the last 12 years, Iran's domestic consumption has more than doubled from 80 bcm in 2002, up to more than 160 bcm in 2014. It is notable that Turkey imports Iranian gas to the amount of about 10 bcm/year, via the Tabriz-Ankara pipeline, with a throughput capacity of a maximum 14 bcm. However, supplying large volumes of gas to Europe must remain a long-term goal for now. Turkmenistan is in a much better situation - due to the nation’s relatively small population and low domestic demand for natural gas; which means that domestic consumption is not a challenge for it, and the net export capacity is still big. In 2013, the production level was 62.3 bcm, but domestic consumption only reached 22.3 bcm. By 2030, it is planned to increase the production of these volumes up to 230 bcm, and use them mostly for exports. The EU has stressed that it is ready to buy solid amounts of Turkmen gas in the long-run, paying in hard currency. It is also willing to support Turkmenistan’s linking up with the SGC. By diversifying its natural gas exports to Europe, Turkmenistan could become the key energy supplier in the region. This perspective is clearly justified as the construction of a powerful gas transmitting system, the East-West, will ensure the efficient transportation of significant natural gas amounts to the country’s port city, Türkmenbaşy, which is supposed to be the starting point of the proposed Trans-Caspian pipeline (TCP), a 300-kilometer pipeline under the Caspian Sea to Azerbaijan, and the SGC. 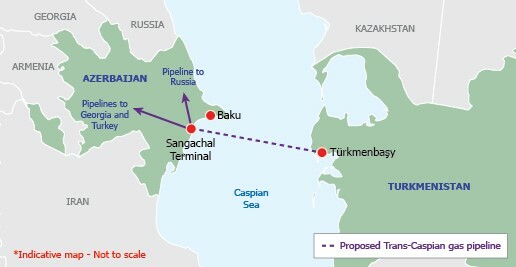 The East-West pipeline project will be connected with the TCP, and will play a major role in the export of Turkmen gas to Europe, by going under the Caspian Sea. Technically speaking, the TCP pipeline can be built by 2020. However, to overcome political obstacles standing in the way of Turkmen gas to Europe, more effort will be required. One can see that once the sanctions on Iran are lifted, the breakthrough of Iranian gas exports will likely begin, but, not earlier than 2020, due to the lack of appropriate infrastructure and high domestic consumption. This places Turkmenistan in a more competitive position, due to the prompt completion of the East-West pipeline, and the country’s relatively low domestic consumption. For the delivery of Turkmen gas to the European market, the most economical and feasible option is construction of the TCP to Azerbaijan, where it will link with the TANAP. The TCP is the perfect opportunity for Turkmenistan to diversify export routes, which will not only strengthen the country’s energy security, but also increase its strategic importance in the region. In this context, Turkmenistan should focus on joining the mutually beneficial SGC pipeline project, as soon as possible. It would then benefit from diversifying its energy exports, and have the opportunity to increase regional integration with neighbouring countries, such as Azerbaijan and Turkey, whilst participating in competitive, international energy trade. Time will reveal the outcome of the Caspian natural gas race to reach Europe, but Turkmenistan, at this stage, is first ‘out-of-the blocks’.